Kulsum akther, a girl of 12 years has attended class three this year but could not continue for more than a month as her father died. Her mother got married elsewhere and now she attends in a special BRAC school for the working children. Most of the boys and girls at her age are supposed to be at sixth or seventh grade in school. But Kulsum defaulted several times before finally dropping out of school. However, it is not only Kulsum but many others like her attending in the special BRAC School. You might be thinking of such a situation in a remote village or char land in the northern region of Bangladesh? In an emerging middle income country how can it be possible that so many kids are dropping out of school in a city area? But Kulsum resides in the capital’s vashantek slum and there are many others like kulsum here. BRAC, a prominent NGO, runs a special school which is only open to the irregular students. Classes take place in two shifts in this school. We went there in the day shift and found more than 20 students of different age, ranging from 8 to 15, in the same class. All the children had almost same stories. Some are orphans, some do not know where their fathers live, and some have to provide full financial support to their families. Poverty and lack of fundamental rights have been the common reason behind their misery. Miserable condition of some dropped out children is only a sample of many such aspects of livelihood in vashantek slum. People are not merely living but struggling to live in the slum. Vashantek slum was founded in 1974 at Kafrul, Dhaka. Less than 1000 households were staying here during the early years after it was founded. At the same time, Concern, an international NGO working in Bangladesh, started to support people here to become self-reliant. Since then more people came and started living here. People at vashantek slum are used to living from hand to mouth everyday. They have very limited assets and they do not get viable support from any agency or government to drive out their misery. Both men and women in most of the households were found to be working. Common professions for men include: rickshaw pulling, van driving, bus driving, lower category jobs in office, pottery etc. Common profession for women include: working as domestic servant, seamstress etc. Rising cost of livelihood in the city leaves them very little to save. These odd jobs are toilsome and consume lot of energy from the body. But slum dwellers intake a very small amount of protein everyday. Given their limited income they cannot have meat, fish and other protein enriched foods in the meal. Slum dwellers can be classified into four income categories. The first one ranges between taka 1000-3000 and almost fifty percent of the people falls within this. The second one ranges between taka 3000-5000 where thirty percent of people falls. Twenty percent earns an amount between taka 5000-8000 and only ten percent have an income within 8000-10000 per month. Children of these poor slum families were also found to be working along with their parents. “My two sons could not continue education due to poverty”-a women residing in the slum told us. She said her sons went to school but could not continue for more than 3 years and they started working. One of her son is a helper of a bus and another son sells “jhalmuri” on the street. Basic utilities for life in the city are not available in vashantek slum. Expressing his anger on a government an old man was saying that “despite living here for more than twenty years we do not get any gas”. There is no legal electricity connection in the slum. People use energy from illegal lines and pay money to local brokers. Government is losing huge amount of revenue here. Even there is no planned sewerage system in the slum. Recently some NGO’s have built several sanitary toilets and bathrooms at several key points of vashantek slum. They have also managed water supply facility to some areas of the slum. Vashantek slum is located on government land and people do not have to pay house rent to anyone. Currently the slum dwellers are permanent residents of the slum though it is a result of a long struggle. On 17th April, 1997 government started clearing of the slum without any prior notice and almost all of the houses were bulldozed. Local politicians of Awami League managed the consent of the then prime minister Sheikh Hasina to stop clearing operation. Although people remained in the land but with a sudden loss of their houses. In 2002 again the threat of eviction appeared. People of the slum were given prior notice by the government and they were requested to leave before the clearing starts. At this time slum dwellers made appeals to Supreme Court. Dr. Kamal Hossain, prominent lawyer of Bangladesh helped the slum dwellers in dealing with the appeal without taking any charge from them. The court ruled out the clearing operation before all the people are rehabilitated to a proper place. Since then the people living here no more feel the threat of eviction but with a hope of rehabilitation to a proper living place. Though living within the hard realities of life, residents of vashantek slum want to educate their children. With all the people we talked, we found all of them having the dream to prosper in future. And the key to this they believed was through sending their children to school. A woman said that, “if I send my children to school instead of working, the return would be multiplied in future”. Although the woman had to pay for the education of her children and she was losing the income she could have if her children went to work. But she also knew her children would earn more if they can be educated. Some slum dwellers were deploring as they could not attend schools in their childhood. Another man was saying that “I am not getting any job in any office as I am uneducated. But some of my school friends completed their school and now they are employed in several offices and earn better than me”. Vashantek slum felled under the catchment area of two primary schools of which one has been recently became registered. Like slums, these schools were also burdened with several problems. Most of the slum children go to Muktijuddha primary school. There were only five teachers against the requirement of ten. Teachers also complained that they do not get their salaries on time. This year they got their first payment in January. They also got their eid payment after the festival. Classrooms of the school are also outnumbered by the students. There is not enough furniture in the classrooms of this school. Teachers told that most of the children of the school come from poor families. Relatively well-off families send their children to kindergarten or renowned primary schools. Muktijuddha school teacher’s complained that their school land has been grabbed by a powerful local politician and currently there is no playing ground in the school. As a result most of the children cannot play and no annual sports functions are held in the school. There are also BRAC runs schools in the slum. BRAC has two primary schools for regular students and one school for the dropped out children. Students do not have to pay and they are provided with necessary books and other stationeries from BRAC schools. There is a special school of BRAC where only dropped out children participate. It is seen that many students who went to schools some years ago, and discontinued later. Some of the dropped out children complained that government primary schools demand fees every year during admission and before examination. They could not pay the fees and were dispelled from the school. But the primary school authority denied the allegation. All of them had the same problem behind drop out and it was poverty. But one typical problem of vashantek slum is “polygamy” and it remains uncovered yet now. Some dropped out children told us that their father married elsewhere and left them with their mother. Many women of the slum told us that this is a common scenario of vashantek slum. With all the women we talked, only a small number were there whose husbands had not yet married twice. The women were feeling a bit shy talking this issue. The practice of polygamy has worsened the economic condition of many families. The limited income of one man has to be distributed in two families after a man gets married twice. As a result the small family budget gets smaller. Though many NGO’s are working on several social problems of the slum, there is no such program to stop the practice of double marriage among men. 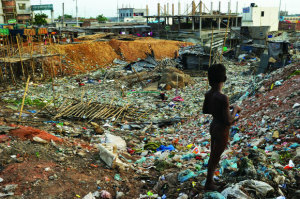 Scenes of destitution in vashantek slum represent the common condition of slums of Dhaka city. More than 13 million people now live in Dhaka city and among them more than 3 million live in slum. Government has no specific project to improve the livelihood of slum dwellers. The number of slums and slum dwellers in Dhaka is on rise due to the increasing rate of urban migration. As our rural economic structure is failing to create employment opportunities for people, more and more from rural areas are coming to Dhaka and other cities of Bangladesh. Slums are the only destination for most of these poor migrants. Government does not have any exact data on several aspects of slums in Dhaka city. A slum census was carried out in 1988 and since then no more observation was made. In 2014, government will conduct a survey of slums of Bangladesh. There is no denying the fact that political commitment is an important determinant to improve the living condition of slum areas. But vashantek slum has been a scapegoat of dirty political culture of Bangladesh. The slum was founded by Sheikh Mujibor Rahman who was the supreme leader of Awami League since the liberation of Bangladesh. Most of the people of the slum support Awami League and it is one of their permanent vote banks. BNP (Bangladesh Nationalist Party) is the other dominant player in election. BNP wants to demolish the vote bank of Awami League and for that reason they authorized the clearing in 2002. The reason why clearing stopped in 1997 was the lobby of local Awami League politicians with Sheikh Hasina, present leader of the party. However, it was also reported that awami league leaders use the slum as their safe zone. Young slum dwellers often take part in the political activities of awami league. During strikes, slum boys were used by the awami league leaders and they were seen to be using have several types of local weapons. Life, as it is said, is a grim reality. They face several difficulties in their life and struggle to drive them out of the way. The powerful force backing up all their attempts to keep moving forward is a four letter word, “hope”. We all hope a better future and a better life. Obviously, vashantek slum dwellers do not hope to device atom bomb or free Switzerland three nights trip. Their only hope is a decent rehabilitation. Since the slum was established, once rehabilitation was made in 1988. Around 2000 households were rehabilitated to khas lands of Bauniabad, Mirpur. At present there are more than 5000 households residing in vashantek slum. Government initiated a rehabilitation program, VRP (Vashantek Rehabilitation Program), for the slum dwellers at cheap cost. It was supposed that slum dwellers will get a flat in VRP in exchange for a small amount of money. But this hope never came true. Only the seed of hope was planted, but it did not harvest. VRP has been a breeding ground of abuse and corruption. Many well off families who are not permanent residents of vashantek slum got the allocation of VRP flats. Initially it was said that each of the households has to pay a total amount of 155000 (In several installations) taka to be rehabilitated at VRP flats. And these households must be the permanent residents of vashantek slum. But the slum dwellers complained that they more than 500000 taka was demanded from them. It is not possible for the poor slum people to subscribe this huge amount of money. Despite this open corruption, no measure has been taken yet. It seems that there is no anti corruption commission in Bangladesh although they remain busy in filing corruption charges based on political motives.